Barb Wire Leather Cords 2.5mm round, regular color - lavender. 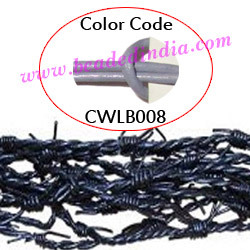 supper quality 2.5mm round barbed wire leather cords, regular color - lavender as per the photograph, pack of 25 meters. Smocky Quartz 4mm round semi precious gemstone beads. Copper Metal Caps, size: 6x11mm, weight: 1.36 grams. Rainbow 4mm round semi precious gemstone beads. Goldstone 8mm round semi precious gemstone beads. Sterling Silver .925 Headpin size: 1 inch (25 mm), head size : 3x3.5mm, weight: 0.2 grams. Silver Plated Metal Chain, size: 1x5mm, approx 19.2 meters in a Kg. Barb Wire Leather Cords 2.0mm round, regular color - camel. Gold Plated Metal Chain, size: 1x14mm, approx 9.5 meters in a Kg.